The year was 1999. Kids had been into Pokemon as a full-fledged mania for nearly two years. Christmas was only a couple of months away and I still didn’t have a good suggestion for my nephews. They were waaaaaay into Pokemon anything at the time. 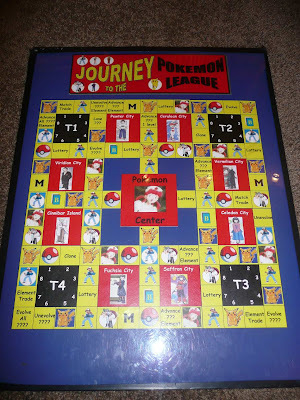 It seemed like the perfect time to give them a nice Pokemon board game that revolved around the whole concept of Pokemon…whatever in the hell that was. But what I found out is that there weren’t really any good games. Sure, there was yet another Monopoly one and there was the trading card game but that required tons of expensive trading cards. “I know, I’ll just invent one myself and make it for them,” I thought. So I did the research to figure out what these things were and what the whole point was. And then I designed a concept and a board for it. My first board sucked. It was huge and colorful but in playing on it I found it was too difficult to move around quickly and the desired place to go was in the corner and so much of the board never got played. I put the main destination in the center and used it for the starting position. I also conceived of four different “teleport” spaces that you could go into to get somewhere else on the board quickly but the dice roll affected your control on where. I thought it pretty ingenious. The basic concept was to collect, train and battle your Pokemon against various “gym” owners. First one to a specific mission wins. Since trading cards were BIG back then, I included a ton of pseudo cards in the game. Some you could get “from the wild” and some you could pick specifically through other methods. I had it all. 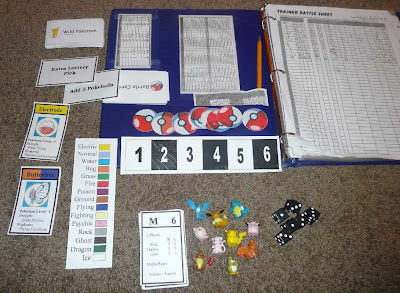 I had little plastic Pokemon characters, a lottery feature, battlecards, pokeballs for cadence of the game control. 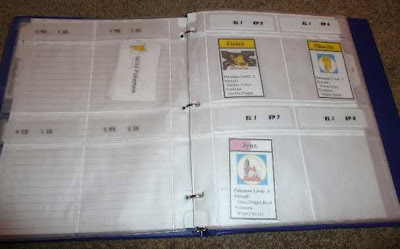 Keeping your Pokemon in a trading card notebook was also all the rage. I incorporated it into the game. As you used the goofy characters they gained experience and advanced up in skill which meant more dice and better rolls that could be gotten in future battles. There was a lot of balance and strategy to the game even though the rules were pretty straight forward. The other neat thing is that you could define the game to play in 30 minutes or several days depending on how you defined the mission of a game. I made two prototypes. One I gave to them for Christmas (they were blown away) and another I kept. Later, through encouragement of others, I was in discussions with Hasbro. I had only two problems with the game. First, it was already a trademarked thing and second, the Pokemon craze was waning. VE, if / when Pokemon comes back, you'll be well placed. As to the marketing aspects, well, some crazes are just that. so, you need to keep the game, but be ready to give it a make-over when the next craze is waxing and you'll be golden. impressive. damn those trademark lawyers for getting in your way. funny how they always seem to have a way of doing that. That's too bad you didn't do it a bit earlier and cashed in on that cow! My Dad invented a game when I was a kid. We played it all the time. Everyone encouraged him to get a patent but no, he said he had just made it up for us. Forward many, many years and Mattel comes out with a very similar game! Damn!! Once the kids grow up, they don't wanna play this stuff anymore. chris - It was a fun exercise for the time. Ultimately everything else (marketing, sales, etc) wasn't about the creative aspect of making the game and I got bored with that stuff. anne - True...but I'll run into the same trademark challenges on any new craze. Guess I need to create my own craze...that's the challenge! incredible woody - I know the feeling. I have a book full of inventions and ideas and many of them are products now. Oh well. moooooog35 - I suspect you are the master of "where's my finger"!!! Holy crap, VE, you should STILL try to market it. Pokemon is still around; could you digitize it into a Wii / online game??? Daughter has boxes and boxes of Pokemon stuff; games, cards, stuffed toys, PVCs... some from Japan. I kept it all for her. That is so cool that you created all of that. VE, just wait a few years and re-invent it. That's what the toy makers have been doing, all along. Problem is, even THEY don't know what the next big craze is gonna be. And they have those big research think-tanks! Anywhere it says Pokemon, subsitute American Idol and you'll be rich! wow, that's really pretty impressive. and what a cool thing to be able to enjoy with your kids. As the mother of a former pokemon addict, I can tell you this game would have totally rawked! You could change it into a SpongeBob game. Looks like he is NEVER going to wane. Fast forward to 2009 - 2 of my kids are huge Pokemon freaks. Luckily they have lots of older cousins who were Pokemon freaks back in the day, so they now have a gazillion cards that have been handed down. I remember the Pokee man craze. I was in college and all the guys were trying to Poke...Oh wait your talking about a kids game. Nevermind. That's really great! I wish that would have been around years ago. I had two boys that I used to babysit who were really into Pokeman, but there was no real way for me to play with them. This would have been perfect. Have you tried one with the Characters from Watchman, Iron Man or the Transformers. Naruto is popular. You could even do a Barbie one and we all know how long she has been around. The kids still seem to love Sponge Bob and Patrick. I have faith that you can come up with some great games. I mean look at all the opoly games. They were great. Anyway we have started our GHOST POSTS for Friday the 13th, come by and visit for a spookily good time. All are welcome to join in or read the ones posted. Just click my link. We hope you like them all. The ghouls will be out tonight. Wow, that is an amazing amount of work! When my students were in third grade that's all they could think about! I found a Pokemon game at a used bookstore and brought it to school It wasn't even that good, but the kids would work so hard just so they could earn 15 minutes of play time with the game. They would have gone nuts over yours!! maureen - As usual, I liked the researching and creating aspect of it but not the sales and marketing part. subtorp77 - True. THEY are adults trying to predict what kids want. Good luck with that. mj - That's exactly how I felt. So I took matters into my own hands. mrsupole - Oh I have a bunch of game ideas written in a journal but this was one of only two that I ever took to a working prototype stage and this was by far the most involved. The other was a Crash Bandicoot game. Oh, and I'll check out the Ghost Story festival too. Plus, your dang meme will be Monday's post. elizabeth - Yeah, I played with the kids on a 6 hour game with it once. That was the fun of it; you could really extend it out if you wanted to. And I've never seen you delete a post before! Is it coming back soon? megan - Oh, you saw that deleted post? Ignore it. It'll be there on Monday. I was preloading it and hit publish by accident. I had a ton of links to set up with the post and it was easier just to schedule it rather than try and do it Monday morning. You never cease to amaze me!!!! That is awesome, VE. It sounds like fun. reforminggeek - It is fun when you play it with kids. dee - Well don't go away too far! Wow you impressed me with this one. If my dad had followed through with his two inventions we would have been very rich as both are still very popular today.When he was about 19 he put a wringer washer's motor on a bike. Guess what he was going for? The Motorcycle of course. The second when I was a child of about 6 he put a motor on a sled which he had put skies on the bottom of. he added a car seat in the middle and had a stearing column attached in front. He had a little trouble figuring out the stopping details but had he followed trough He would have been the inventor of the snowmobile. Yesterday he celebrated his 90th birthday. Unfortunally he has alheizmers and really had no clue as to why we were there with him. So keep inventing as maybe one day you too will actually follow through and be famous. That is quite impressive, my friend. I'd never have the patience to come up with something like that. Not to mention, I'd be too lazy. gab - Well now those are much more significant inventions than a silly game! Wow. dalton - Thanks. Normally I don't see things through to this level of completeness; I get bored and move on. That's why I thought I'd go ahead and write about it since it really does exist. I'm so impressed I can't even think of anything witty/sarcastic/irreverent to say. Most impressive. There was about 3 years where our house was nothing but Pokemon. Dad! Austin took my Charzard! Waaaaa! I even had a neighbor dad call me up one night and chew me out because he thought my nephew stole one of his cards. Weird stuff. This is seriously good! I no nothing about the game market, but I sincerely think it's, well, pretty terrific you did this. Sounds like you put a lot of work into it, just wait for the next craze and transfer it over... they are all the same. The thing with these characters is they always come back into fashion at some stage. I mean Tazo's are back over here . . just a matter of time before Pokemon grabs the playground. One thing I do like is that kids still enjoy 'board' games. They're not all welded to a video game. Well done. Thanks VE for visiting all of our Ghost Posts, I am glad you enjoyed them all. The next Friday 13th will be in November I think. That should give you plenty of time to plan for it. And we should have a lot more who join in, since we will have more planning time. And I just knew that meme was meant for you. I cannot wait to see what write. It will be a fun read I am feeling. Yup totally meant for you. I quit school because they had recess! wow. very cool. should have pushed on. still have a few kids i work with that would flip out over it. janna - Well that's shocking! I don't know what to say about that either! baino - Yes, they even get burned out on video games. Who would have thunk? mrsupole - I enjoyed them all. I'll participate next time. uncivil - And now we have recession, isn't that like adult recess? That looks like a pretty cool game. More interesting that much of what is on the market. carla - I thought the board design came out very colorful and interesting. It's been played long enough to tweak the flaws out of it too. I missed the Pokeman craze, but your game actually looks like fun. serena - Thanks. You're fortunate to have missed it!